Mazes + balls = fun times. Too bad this game takes less than 25 minutes to beat. That old phrase, "you get what you pay for" perfectly describes Carl Loodberg's free iPhone App, Labyrinth Lite Edition. While technically sound and fun, there's not enough content. We know, it's free and we shouldn't complain, but when a game is good, we can't help but dream of the possibilities. 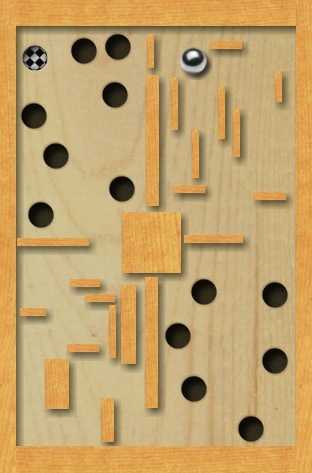 Loodberg's game challenges you to maneuver a tiny, silver ball through a maze without falling into a bottomless pit. There are ten levels, each progressively more difficult, and superb accelerometer controls enable you to effortlessly tilt the phone to make the ball move in the desired direction. It plays great, looks good and is without question one of the iPhone's best free Apps. Therein, however, lies the problem. It took us less than 20 minutes to beat the game and we wanted more, but it cuts off. No leaderboards and no additional levels. We foresee ourselves whipping it out every now and then to pass the time, but we can only play the same boards for so long. Thankfully, the game hints at additional content, since (after hitting Play), it reads "Choose level pack". That said, we certainly hope that more are on the way. If Carl and his team manage to create more diverse game boards with moving parts and various obstructions, Labyrinth could quickly become the iPhone's Marble Madness, and we're all for that. What's Hot: Excellent accelerometer controls, cool physics, free. What's Not: Only ten levels.